It is an honor for my painting called "Daily Duties" to have been accepted into this exhibit. 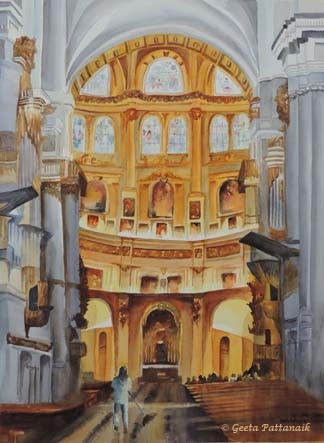 It is approximately 29" x 21.5" and is of a scene in the Basilica in Granada, Spain. The grandeur of the setting is magnificent, but what brought the idea of the painting to my mind were the workers, who were sweeping and cleaning the floors. Individuals such as the one depicted here, were responsible for keeping their heritage alive. This painting is a study in contrasts and perspective. I drew one person from behind, and put her in the foreground with a broom. The person was a conglomeration of many individuals, so I did not actually have one image to draw from. The view of the Basilica is also composed from many images. I committed a lot to memory, did value sketches and color notes for the painting to accurately transfer my ideas on to the paper. The painting is composed, slightly off center, with different elements on either side, so they are not mirror images of each other. The pale grey walls in the front are lit from the right by windows and outside light, so the left walls are brighter than the ones on the right. The grey walls and columns frame the interior gilded and warmly lit area. This area is lit entirely by artificial light, but higher up, the cool outside light can be seen through the stained glass windows. The main figure stands on tile work that lead the eye in towards the inner arch, which is one of the darkest spots of the painting, but there is also a flash of outside light on the floor by her. She is set there within the warm colors, which in turn are framed by the cool colors. The painting is done with very few colors and layers. I wanted some areas to have a light, airy touch, like the stained glass windows, and some to be laden with the depth and darkness of an old historic building. History is present, without all the detailed brushwork. It took me several years after seeing the place to start this painting. I wanted it to be thoroughly settled in my mind and have all the ideas sorted out, before embarking on the painting itself. I knew what I wanted it to look like finally, so it was a question of trying to work towards that.